I got here last Thursday at 6:30AM, bleary from my red eye flight and dehydrated from a slight bout of food poisoning (from my last decadent San Francisco meal, nonetheless — a rather appropriate goodbye from the city). I was seriously worried I wasn't going to make my flight, rushing home straight from work to dispose of my mattress, clean the apartment bathroom, and drop off the keys. But I made it, I made it! And things have been great so far! The first thing I did was eat a bagel from my favorite bagel place (that is so far uptown that it often gets ignored by everybody else — but that's coz everyone's a fool), cuddle my cat, and take a tour of the building's rooftop garden. This past weekend, we toured some potential future neighborhoods in Brooklyn, ate rolled-up ice cream (they literally ROLL the ice cream — not even joking), and celebrated our joint birthdays with a spicy meal at a Michelin-starred dive bar with Thai food in Nolita. There were also 4th of July fireworks and cake! We usually celebrate Erlend's birthday with yellow cake, but this year, I decided to switch it up with this Frankenstein cake. 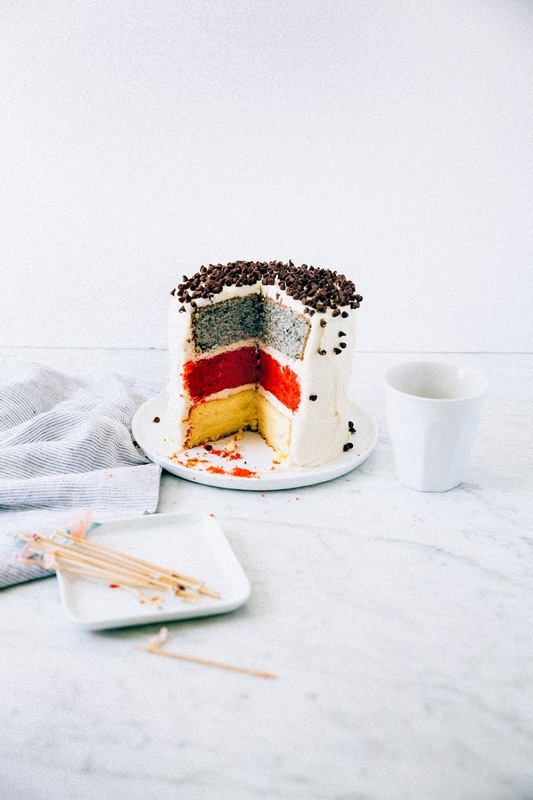 Our traditional yellow butter cake is still there (because it turns out I am a sucker for tradition), but this time, it was joined with an incredibly moist red velvet and black sesame cake layers. 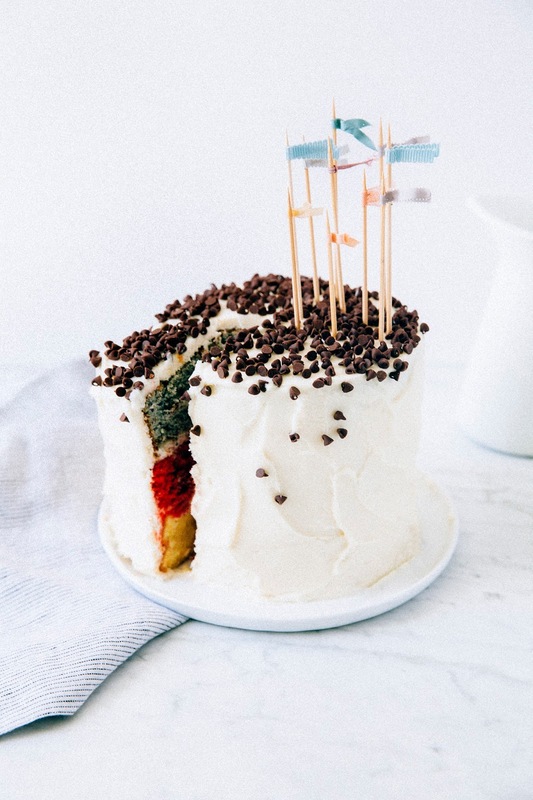 I covered the layers with a classic cream cheese frosting and mini chocolate chips, creating quite the colorful surprise when sliced. Okay, I know it's time consuming and ridiculous to make three different cake recipes for one cake. So real talk — I didn't actually make all the layers in the same day. Instead, I made different recipes throughout the span of three weeks, baking one layer every weekend. 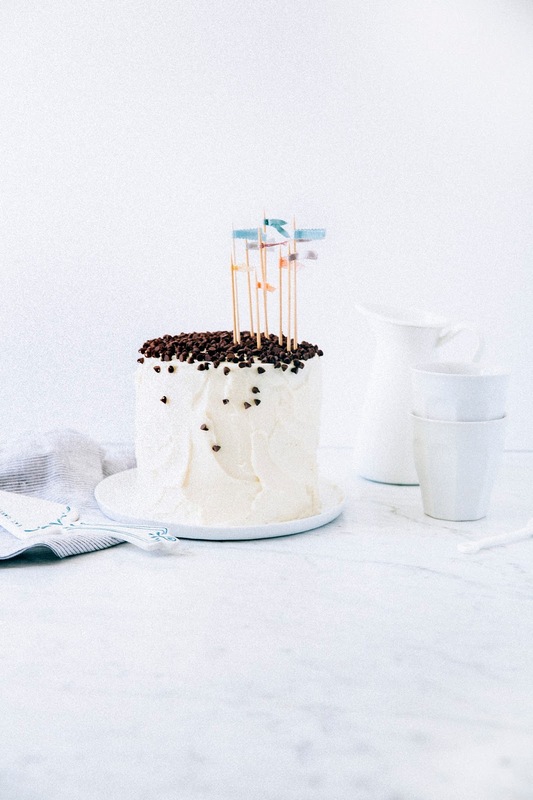 Cakes tend to freeze beautifully (check out The Kitchn's tips on how to freeze and store baked cakes), and tend to be easier to level and frost when chilled anyway. 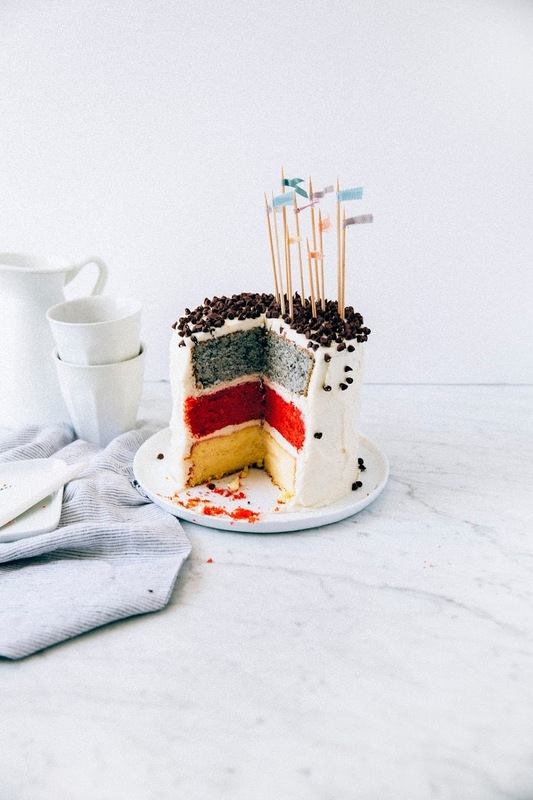 Alternatively, you can always make recipes for three layer 9-inch cakes in four 6-inch cake pans — reserve one layer in the freezer for any future Frankenstein cakes! 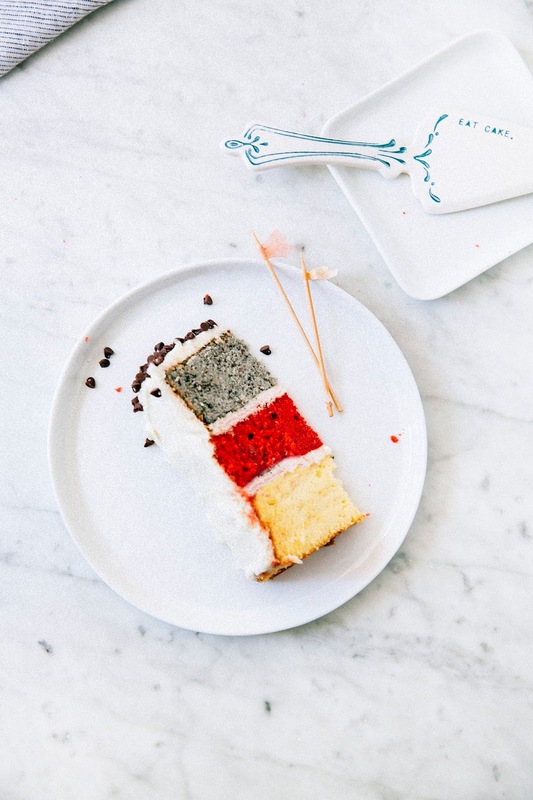 This way, you can come up with all different sorts of cake combinations and not stick with mine. Another great way to save time with this recipe lies with the black sesame cake layer. The recipe instructs you to toast the sesame seeds in the oven and allow them to cool completely before crushing them in a food processor. You can do this for up to one month ahead of time as long as you keep the processed seeds in an airtight container in the refrigerator — but you should be doing that anyway because black sesame seeds are so fatty, they tend to go rancid pretty quickly at room temperature. First, roast the black sesame seeds. Center a rack in the oven and preheat to 400 (F). Spread 1/4 cup black sesame seeds evenly across a baking tray, before placing inside the oven. Use a heatproof rubber spatula to stir and toss the seeds every 3 to 4 minutes to ensure that they're being evenly heated, baking for a total of 15 to 17 minutes. Towards the end, the seeds should turn a light brown color and start to steam and smoke. To check that the seeds are ready, rub a seed between your fingers. The seed should shatter and crush easily into smaller grains, emitting a nutty and fragrant smell. When the seeds pass this test, immediately transfer to a cooler plate on a wire rack to prevent any burning. Cool completely to room temperature. Once the seeds cool off completely, transfer to the bowl of a food processor. Pulse the seeds in a food processor until finely ground; the mixture should resemble super-fine cornmeal. It took my food processor around 20 seconds of pulsing to achieve the desired texture. DO NOT PULSE IN ONE BIG BATCH — otherwise, you risk the seeds turning into a butter instead of sugar. Transfer to an airtight container and refrigerate until ready to use. Center a rack in the oven and preheat to 350 (F). Prepare a 6 x 3-inch cake pan by spraying generously with cooking spray and lining the bottom with a parchment paper circle. Spray the parchment paper with cooking spray. Set aside. In the bowl of a freestanding electric mixer fitted with a paddle attachment, combine the ground toasted black sesame seeds, 1/2 cup plus 1/3 cup cake flour, 1/2 cup granulated sugar, 1 teaspoon baking powder, and 1/4 teaspoon kosher salt. Give the mixture a quick paddle on low speed to combine the ingredients. With the mixture running on low speed, gradually add the pieces of 3 tablespoons cold unsalted butter, one piece at a time. Beat until all the butter has been incorporated, about 3 minutes. The mixture should have a fine, crumbly, and cornmeal-like texture. In a medium liquid measuring cup, whisk together 1/4 cup plus 2 tablespoons whole milk, 2 large egg whites, and 1 teaspoon pure vanilla extract. With the mixer running on low speed, add the liquid ingredients in 3 parts, scraping down the sides of the bowl after each addition. Increase the mixer speed to medium and beat for 1 minute, before turning off the mixer completely. DO NOT OVERMIX OR YOUR CAKE WILL BE TOUGH AND I WILL CRY. 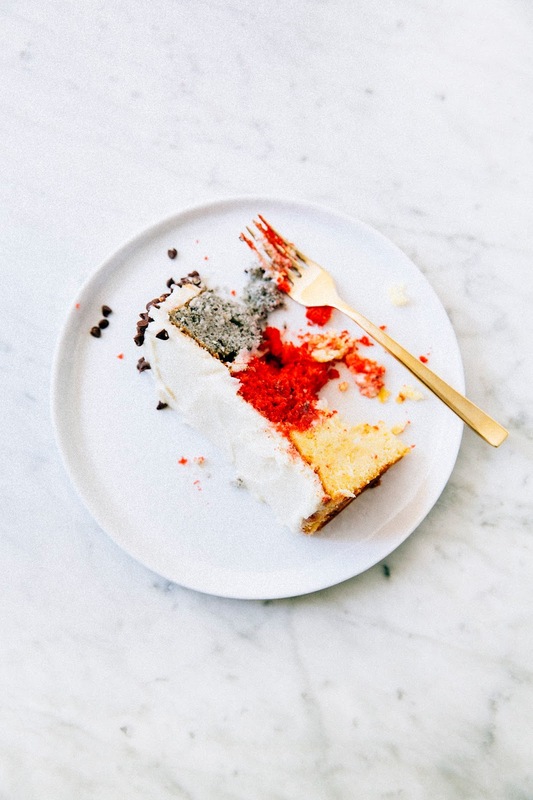 Scoop the batter into the prepared cake pan and bake for 25 to 30 minutes, or until a wooden toothpick inserted into the center comes out clean and the top of the cake bounces back when slightly prodded. Transfer to a wire rack to cool completely. In a medium bowl, combine 1/2 cup plus 2 tablespoons all-purpose flour, 1 1/2 teaspoons natural unsweetened cocoa powder, 1/2 teaspoon baking soda, and 1/4 teaspoon kosher salt. Whisk together until combined. Set aside. In a freestanding electric mixer fitted with a paddle attachment, combine 1/4 cup vegetable oil and 1/2 cup granulated sugar. Beat together on medium-high speed until pale and fluffy, about 3 to 4 minutes. Lower the mixer speed to its slowest setting and add 1 large egg. 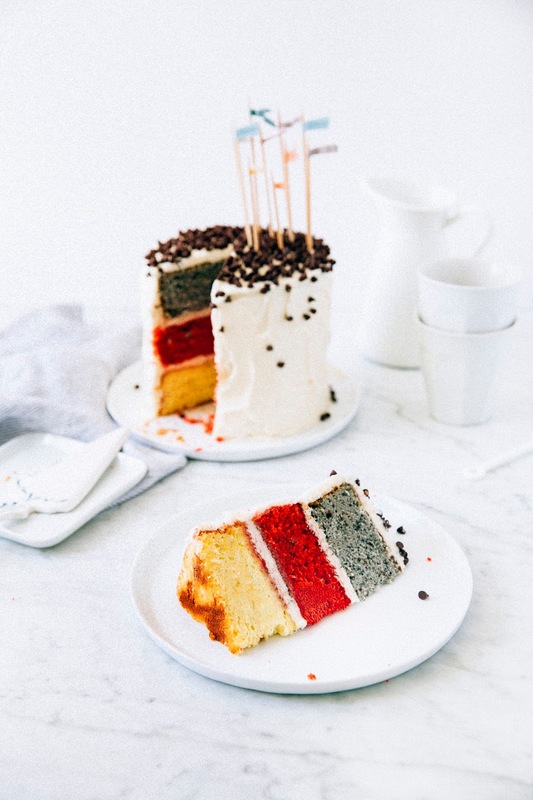 With the mixer still on its lowest speed, add 1 1/2 teaspoons red food coloring, 3/4 teaspoon pure vanilla extract, and 1/4 teaspoon white vinegar and continue to mix the batter until the red food coloring is fully incorporated. Once the batter is a vibrant red, keep the mixer speed on its lowest setting and add the dry ingredients (from the 2nd step) in three parts, alternating with 1/4 cup buttermilk in two parts, starting and ending with the dry ingredients. Once the last of the dry ingredients have been added, increase the mixer speed to medium and beat for 1 minute, before turning off the mixer completely. DO NOT OVERMIX OR YOUR CAKE WILL BE TOUGH AND I WILL CRY. In a medium bowl, whisk together 1/2 cup plus 1/3 cup all-purpose flour, 1 teaspoon baking powder, and 1/4 heaping teaspoon of kosher salt. Set aside. In the bowl of a freestanding electric mixer fitted with a paddle attachment, combine 7 tablespoons unsalted butter with 1/2 cup granulated sugar. Beat on medium speed until extremely light and fluffy, at least 10 minutes. In a liquid measuring cup, whisk together 1/3 cup buttermilk and 1/2 teaspoon vanilla extract. With the mixer on its lowest speed, add the dry ingredients (from the 3rd step) in three additions, alternating with the buttermilk and vanilla mixture in two additions, beginning and ending with the dry ingredients. After each addition, beat until just combined — DO NOT OVERMIX at this stage, or you'll end up with a dense, tough cake that will make me sad. Use a rubber spatula to transfer the batter into the prepared cake pan, smoothing the top into an even, flat layer. Bake in the preheated oven until the cakes are lightly browned and a wooden skewer inserted into the center comes out clean, about 25 to 30 minutes. Transfer to a wire rack to cool completely. In the bowl of a freestanding electric stand mixer fitted with a paddle attachment, beat 8 ounces cream cheese on medium speed until soft. Add 2 cups unsalted butter, 1 teaspoon pure vanilla extract, and a pinch of kosher salt and beat until light and fluffy, using a rubber spatula to scrape the bowl as necessary, about 3 minutes.